Monday night was the first QUARTERFINAL Fire in the Triad between Chef Wes Patterson of Southern Roots in Jamestown and Chef Gregory John of Greensboro Country Club. Both chefs butchered the competition in the preliminary battles and they found themselves back in the kitchen of the Empire Room in Downtown Greensboro once again. Be sure to check out Fire in the Triad companion pieces in local alternative weekly paper, Yes! Weekly, on the web and newsstands now! Chef Patterson looks menacing and mean, but he's as gentle as Ferdinand. Casual and laid-back, just like his restaurant, he's worked his way up the culinary ladder from a grill cook at age 16 to his current appointment as executive chef of Southern Roots. Chef John is new to the area and to Greensboro Country Club, but not the kitchen. Used to cooking regionally and seasonally, he worked with culinary greats, Thomas Keller and John-Louis Palladin early in his career. The night's guest professional judges: Kathy Hanrahan, editor of WRAL's Out and About, Ray Goodrich, marketing & communications director of Foothills Brewing in Winston-Salem and Bart Ortiz, owner of Tex & Shirley's restaurant in Greensboro & High Point. These folks' scores count for 30% of the overall score and the dining public's scores account for the remaining 70%. Bluefish from the Wanchese Fish Co.
As a resident of Winston-Salem and a heavy beer drinker, I am in love with Foothills Brewing. 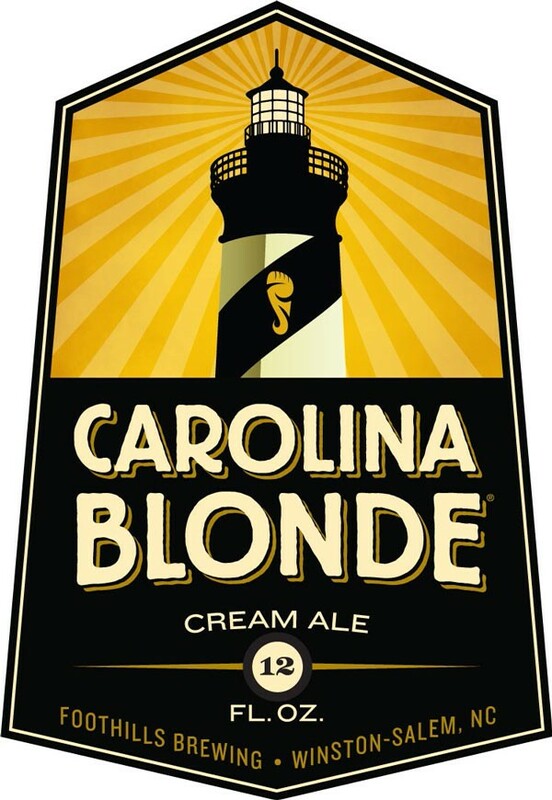 My favorite is Hoppyum but I always start with Carolina Blonde and work my way up to the sweet, hoppy goodness of my favorite. And as for bluefish, it's absolute favorite fish on the planet. Right after Nemo. I love its strong flavor, oily texture and the aroma too. The fish we had Monday night were young, and not as fishy or strong-flavored as the larger, older fish. Each team was given one case of beer and 40 pounds of fish to feed 120 excited, hungry people of the Triad. Blonde and Blue night at Competition Dining! This was a solid first course. Unexpected and something I'd order if it were on a menu in town (hint, hint). There were lots of different flavors were going on here. The pickled vegetables were crisp, tart and the flavor of the Carolina Blonde was pronounced as the jus soaked into the focaccia ever so slightly. The crunch and spice of the pink peppercorn crusted bacon was spicy juxtaposed against the lightly smoked and creamy bluefish. The flavor of the fish was not overpowering, which I liked since bluefish can sometimes take over a dish but the focaccia was not as light and airy as it should have been. The rutabaga chips, crispy and slightly bitter, were a great complement to the vegetables and creamy aioli. This complex dish was presented beautifully. I don't know where the crust of shallot on the fish was, but the fish was cooked well. To me, it was overshadowed by the fanfare of the "farrisotto" (farro cooked in the style of risotto) but still, it was well-executed. The tequila in the pepper relish was strong, but there was not much of this piperade to overpower anything. The beurre blanc was light (well, as light as a sauce made of butter and beer can be) and uplifted by the clean, bubbly flavors of the Carolina Blonde. The bluefish was turned red with the tandoor mixture of spices and it was delicious. Traditionally, tandoori meats are created in a clay oven called a tandoor. The spices associated with this style of cooking are garam masala, ginger, cumin, coriander, paprika, turmeric and cayenne.This Indian-inspired fish was very mild and light in flavor, it was almost as if the seasoning was applied tentatively. The beer braised barley was not my favorite. The flavor was fantastic: earthy bits of mushrooms, soaked in yeasty, aromatic beer. The texture left much to be desired: It was oily, toothsome and tasted like porridge a la Oliver Twist. The lemon mint coulis melted into the fish as the battered fennel crunched like onions. Lastly, I came to the beet salad. Upon first taste, I really liked it. I really did. It was crunchy, crisp, light, fresh and did not bleed into the rest of the dish, which I much appreciated. But trust me--I still hate beets. The most flavorful dish of the night, the Carolina Blonde Wild Mushroom Jus (or gravy as we call it in these here parts) carried the rest of the dish home in that nest of crispy onions on top. Again, the fish was lost against the other components of the dish, but I was not disappointed. I smelled truffle coming from the kitchen, and tasted it a little in different bites of the dish, but not on the fish. Not only were the gnocci [NO-key] made of root vegetable (potato), they were light, crisped and held onto the gravy in its grooves like a professional. There were bits of root vegetables and bits of bacon hanging out in the gravy. ALLERGY ALERT: I was not able to eat this dish or be in the dining room during this course, but I grilled everyone I passed in the dining room to describe this dish to me. As one diner put it, "It was like grown up PB&J". The peanut butter paired perfectly with the beer and it was creamy and caramelly with a soft finish. 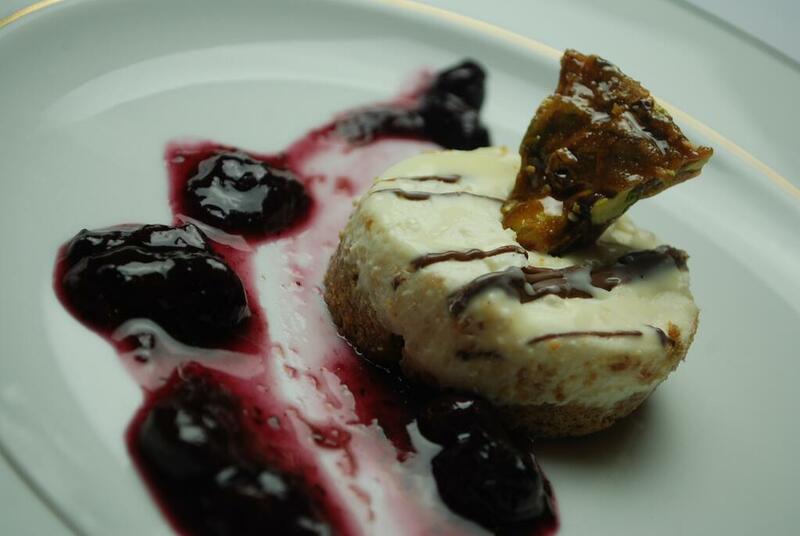 The pistachio brittle was everyone's favorite part and they wanted more of the roasted, sweet crunch it provided. No almond cake for me, my 6th course was a plate of drunken cherries, a piped dollop of whipped cream and a bitter, dark chocolate garnish. I cannot imagine the cake was more drunken than the berries I ate. The concentrated fruity, flavors of the beer were soaked into those cherries making them zippy and full with a warm finish. An old chef trick of dusting a not-so-pretty piece of cake with powdered sugar was employed here, but none of that mattered in the end. I can report that the dining public loved this course more than any course of the competition so far. With an average of 24.24 points out of 30, this dish knocked every other score out of the park. After all of the votes were tallied, it was Chef Gregory John of Greensboro Country Club who courted the Blonde and talked her until she was Bluefish in the face. 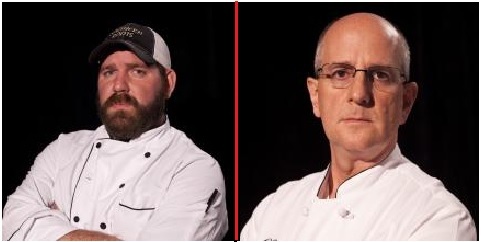 Chef John moves on to the Fire in the Triad semifinals which begin June 18. See his after dinner remarks below. The lovely ladies in the video are his daughters. Read this blog for a nightly recap of Fire in the Triad posts to stay in the loop. You can also follow me on twitter @niksnacks and the hashtag #CompDiningNC for live updates during each battle (The next dinner begins June 4 at 7pm). Please also "like" Competition Dining on Facebook and on the web.